I got in all of the distance and speed I was looking for this past week. I will be out of town Tuesday though Thursday of this week but I am not even going to worry about running those days. I am mentally completely ready for PHM and I am tapering the next two weeks. The last time I did a 12 mile run was on 6/2/12. It was at a 12:09 pace. I am so impressed with myself for how far I have come in 8 months. I can't wait to run this race - TWO WEEKS FROM TODAY! On a side note, I registered for my fifth Half for 2013. I think I'm crazy but that's okay. It feels so good! .... I think I totally screwed up this post by editing it and saving it wrong. It's all out of order now! Ugh. It's that time of year. The Holidays are over but it is still dark, cold, and snowy. Last year, running through the winter helped with my Seasonal Affective Disorder tremendously. This year - not so much. I know I feel a million times better than if I weren't running but I am frustrated and sick of trying to run in the snow. I ran the Chase Your Shadow 5k this past Saturday. I was so pumped! I was feeling so good and really thought I could best my previous PR of 28:50 until we got several inches of snow Friday night and the wind chills were -2. Bubble burst. It was way too slippery to PR. I haven't had a long run since the dreadful and painful 11 mile run almost two weeks ago. 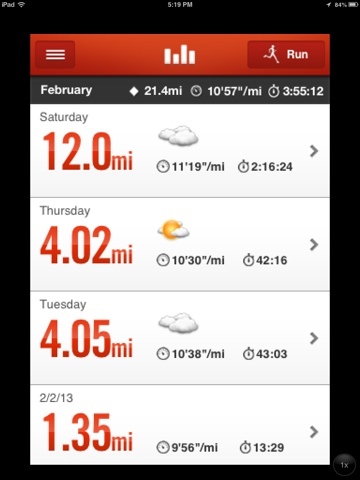 I need to get in some serious miles this week and then taper for PHM! So far, so good. I got 2 miles in yesterday and 4 today. Hoping for 4 or 5 on Thursday and then 12 on Saturday! My last bit of news is that I registered for the Flying Pig Half taking place on May 5th! Gotta have a reason to keep training!